Curveball: The Year I Lost My Grip by Jordan Sonnenblick. Grades 6-9. Scholastic, March 2012. 304 pages. Reviewed from ARC provided by publisher. Freshman year is turning out to be a wild ride for Peter Friedman. After an injury takes him off the field permanently, he's not exactly sure who he is now that he's not a baseball star, and he doesn't know how to tell his best friend that he'll never play again. His photography class is awesome - in no small part because he's partnered with the cute, smart Angelika. But he's worried about his grandfather who's forgetting things more and more often. Life keeps throwing him curveballs and Pete's got to figure out a way to keep on swinging. Once again, Jordan Sonnenblick approaches serious subject matter with his trademark humor and authentic characters. This is a must-read for fans of Sonnenblick's previous work. I literally squealed when I saw this in a box of ARCs Scholastic sent me and I immediately went to Twitter to get the buzz started. 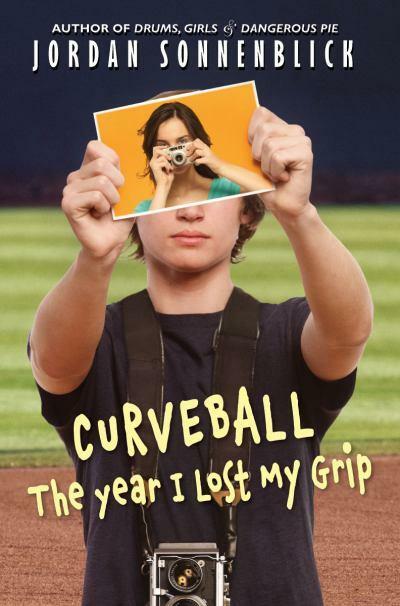 I am a huge fan of Jordan Sonnenblick's previous middle-grade novels and Curveball stood up to my high expectations. Curveball is all about the sudden, unexpected changes that happen in life. Starting high school is a big change for anyone, but Pete expected to be a big-time athlete and suddenly he's having to find a new identity. Grampa's sudden descent into Alzheimer's is another unexpected change in Pete's life, made even more stressful by the fact that he feels like he has to protect his grandfather and keep it a secret. The family unit that Pete should be able to steady himself against is suddenly full of pitfalls and uncertainties. Jordan Sonnenblick writes with authenticity and Pete's voice rang true to me. The humor in the book keeps it light, even as Pete's dealing with serious situations. The pacing is steady and kept me turning the pages, wondering how everything would work out. There's some romance as Pete delves into his first relationship with Angelika, his photography partner, but it's not overdone and the relationship develops organically throughout the book. It's always nice to see some romance from a guy's perspective because that's something guys are dealing with, too. This book will definitely appeal to Sonnenblick's already established audience and it's sure to garner him new fans, as well. Be sure to hand it to fans of Notes from the Midnight Driver. The story's got many of the same elements as L.K. Madigan's wonderful Flash Burnout, so I'd recommend it to fans of that book, as well. Curveball might also serve as a gateway drug of sorts for kids who will only touch sports stories. There's enough of a sports element to satisfy them, although I don't know that I'd call it a Sports Book. Curveball will be on shelves March 1.